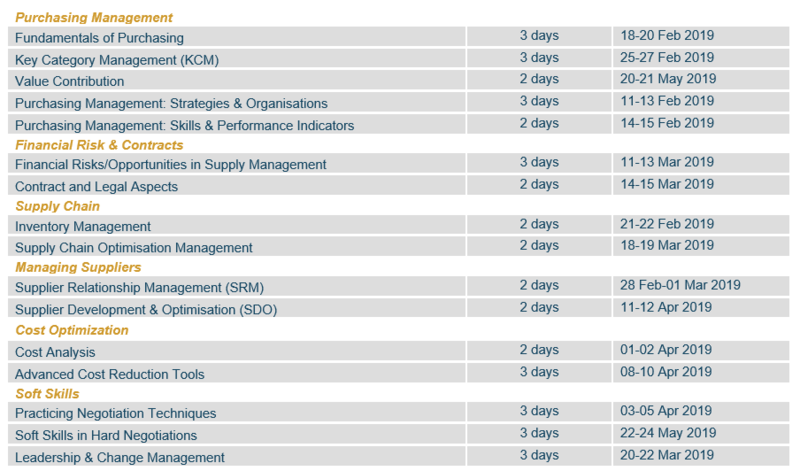 EIPM offers 16 specialised courses covering a complete set of topics that are at the heart of the challenges faced by Purchasing Professionals. Training Modules are conceived around two or three days and the courses bring new perspectives and skills to the entire landscape of the profession, from buyers to upper management. Attending modules is very motivating and is an effective way to fill in a gap or sharpen up on a specific topic. This “à la carte” approach is also appropriate when someone moves cross-functional and needs to come up to speed in certain areas. By successfully completing an exam at the end of their module, participants obtain a certificate of completion. Take your purchasing to the next level! Check our Certification Programmes.